It’s been nearly three months since Hurricane Florence drenched North Carolina and parts of South Carolina, causing significant property damage and economic losses at a projected $17.9 billion. Estimated insured losses range between $4.8 – $5 billion. And the loss felt by those still displaced from their homes is unquantifiable. Photos courtesy of the Carolinas CU Foundation. 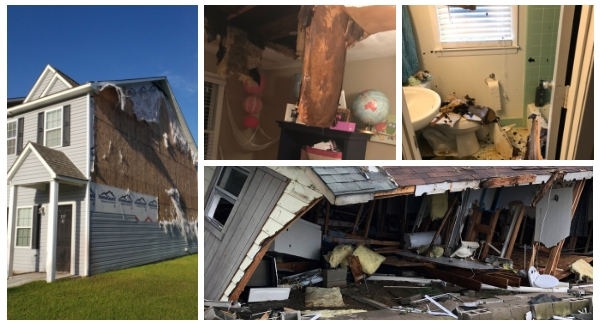 Examples of the devastation to the homes of credit union employees in the Carolinas after Hurricane Florence. In several cases, the damage led to a total loss of their homes. Working quickly following Hurricane Florence, the Carolinas Credit Union League and the Carolinas Credit Union Foundation were quick to assess any operational impact to credit unions and were fortunate to learn of only minimal problems. The real need was from the employees, many of whom had damage to their homes, and in several cases, faced total devastation. Employees in some areas of the Carolinas were unable to get to work because of rising flood waters and wide-spread power outages. Through the Foundation’s Disaster Relief Fund, employees who sustained damage or faced significant evacuation expenses were able to apply for disaster relief aid. 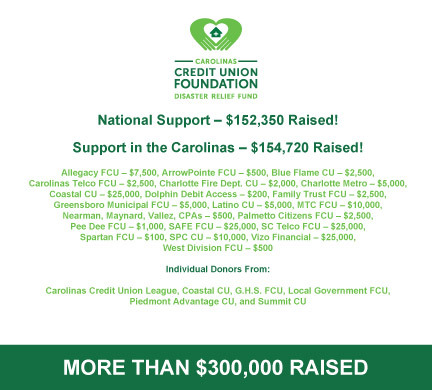 To date, the Carolinas Foundation has processed 257 grants and awarded $178,433.22 in aid to credit union employees in the Carolinas, helping them get back on their feet and serve the needs of credit union members. Phase I grants up to $500 and Phase II grants of up to $1,500 have been provided. Currently, the need for Phase III grants is still being determined. Credit union employees from First Carolina People’s, Fort Bragg, Marine, Self-Help, Sharonview, and State Employees’ have received grants. In mid-October, the Carolinas braced for the worse once more as Hurricane Michael followed after Florence. However, the catastrophic damage of the storm was more strongly felt in the Florida panhandle. With the handful of grants the Carolinas Foundation received after Michael, it was decided to direct those funds to those in greater need. To date, the Southeastern Credit Union Foundation has disbursed a total of $407,800 to 374 credit union employees under Phase I support. They had 11 credit unions impacted by Hurricane Michael as well. They plan to launch Phase II grants by the end of the year for those who had extensive damage. So far, $428,327.77 has been raised by the Southeastern Credit Union Foundation. Credit unions are welcome to make donations to the Southeastern Credit Union Foundation via the Carolinas Credit Union Foundation’s Disaster Relief Fund online here. Please note “Hurricane Michael” at checkout. Donations will be disbursed dollar-for-dollar.